If you are looking for a kitchen renovation to add beauty and value to your home, granite countertops are your best choice. Granite counters are easily the most beautiful addition you could ever make to your home. Beauty – It is worth mentioning again because no other material can match the beauty of granite. Value – Granite adds a good amount of value to your home. Granite counters also hold their value better than other home improvements. Stain resistant – Even hot grease finds it hard to leave a mark on granite. Natural – Granite is a naturally occurring material that is shaped and polished by man. Easy to Clean – Granite’s durability and resistance to many kinds of damage make cleaning a snap. Variety – Each piece of granite is unique and there are hundreds of colors, shades, and patterns of granite to choose from. Cool Surface – Granite has a cool surface that is excellent for food preparation, rolling dough, and candy making. Warm Surface – If you prefer a warm surface, floor heating can be installed under your granite countertop. Complementary – Granite matches well with most types of wood cabinetry. Lasting Beauty – The polish of you granite counters will not wear off. Granite countertops are the best gift you can give to your kitchen and to yourself. Available in an endless variety of colors and patterns, there is a granite countertop that is perfect for your home. 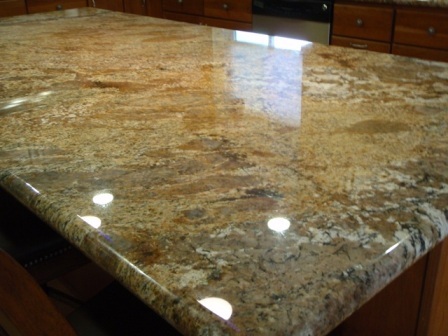 Outer Banks Custom Kitchens has been serving the Outer Banks for 46 years and has an extensive line of granite counters for you to choose from. Call Custom Kitchens today and get your kitchen renovation rolling!